Medion's Erazer X6815 is a powerful and impressive all-round laptop with more than enough punch for your pound, thanks to the inclusion of Intel's sophisticated second-generation Core i7 processor. Gamers are the intended audience, which is obvious from the included GeForce GT 555M graphics card. Despite the powerful components, Medion has kept the price down to £699, and at this price it's an absolute steal. Unfortunately there are some build concessions. For a 15.6-inch laptop, the Erazer is quite the chubbster. At 2.7Kg and with a 37mm chassis, it's heavy compared to other models of the same size, although it's still compact enough to carry around without breaking your back in the process. Sadly, the pad and keyboard have a cheap unreceptive clack and the individual keys are so loose in the chiclet array that we managed to get a couple caught underneath the casing. While typing is easy because the keys are isolated, we don't hold out much hope for longevity before they break. Audio was solid thanks to the Dolby Home Theater v4 HD audio, provided by two speakers and a subwoofer for reproducing the sort of low-end rumble that underpins movie or games soundtracks. It's not going to set the world on fire and disintegrated into a cacophony with the volume up, but was resolutely serviceable for film and music. Medion did a great job by adding a Full HD 1080p screen. It was less glossy, hence less vibrant, than most and the viewing angles disappoint. However, for a single laptop user in lower lights it played back HD video well, and it's hard to complain at this price point. 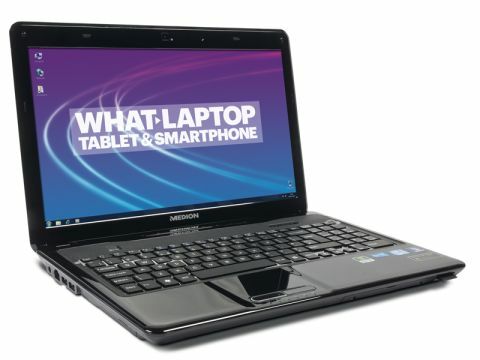 As well as Intel's excellent CPU and Nvidia graphics, the Erazer has 4GB of memory and 500GB of storage. With a great set of specifications under the hood, we had no issues with multimedia playback or multi-tasking with several apps open.